In the last week, I’ve heard “Soulful Strut” covered twice by one of Wisconsin’s best bands, and we heard the original on satellite radio last night. The laid-back soul-jazz instrumental was released as a single in November 1968. It hit No. 3 on the charts for Young-Holt Unlimited, a three-man combo out of Chicago. However, none of the members of Young-Holt Unlimited — neither bass player Eldee Young nor drummer Red Holt nor keyboardist Ken Chaney — played on it. The tune was the backing track for “Am I The Same Girl,” a song co-written by Eugene Record, the husband of singer Barbara Acklin. She recorded the song first for Brunswick Records — Young-Holt’s label — but producer Carl Davis and arranger and co-writer Sonny Sanders stripped her vocal tracks and dropped in a piano solo by session man Floyd Morris to create the instrumental. 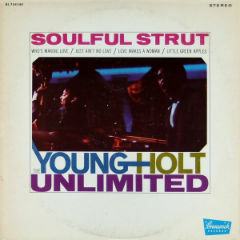 So, though credited to Young-Holt Unlimited and released on their LP of the same name, “Soulful Strut” was created by Brunswick Records session musicians. Young-Holt took one for the team. “Who’s Making Love,” “Please Sunrise, Please,” “Be By My Side,” “What Now My Love,” “Baby Your Light Is Out” and “Soulful Strut,” Young-Holt Unlimited, from “Soulful Strut,” 1968. This is Side 1. It runs 17:40. The LP is out of print, but the last two cuts are available on “The Definitive Young-Holt Unlimited,” a 2005 CD release. Copper Box, that fine band out of Oshkosh, Wisconsin, puts its own twist on “Soulful Strut.” Danny Jerabek replaces the horns with his button accordion and Michelle Jerabek adds the vocals from “Am I The Same Girl.” That version is available on “People Change,” the band’s 2011 CD. Their version just happens to be the first sample on this promo video.